BOOK LAUNCH - JOIN US! At Book Passage, Corte Madera, CA. Saturday, July 14th - Bastille Day! Come help us celebrate the release of my latest book, Help Your Group Thrive: A Workbook and Planning Guide, Routledge Books, is Order your copy now! Please check back for readings in your area. Add your name to our mailing list and we will notify you about upcoming readings and workshops. This easy-to-use manual is for leaders of work groups, coaches, managers, book and servce clubs. Leaders of discussion groups, community organizations and workplace teams, writer’s and critique groups, and students of the social sciences, will find it a valuable resource. 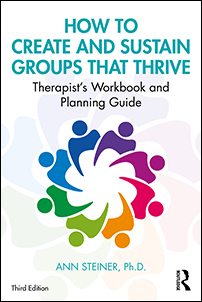 As with her popular book for therapists, this workbook includes an overview of different kinds of groups, sample group agreements, leadership strategies, tips for dealing with common group challenges, numerous modifiable forms and more. The material has been applied successfully to self-help groups, work, and other paraprofessionally led groups. Whether you are considering starting a book group, wanting to find ways to recruit new members who will stay, or want tips to help your work group stay on track, this book's tips and suggestions will help make your group be more effective. Please add your name to my mailing list to be among the first to be notified when the book is available, readings, and book signings! Order Your Copy Today! 20% Discount Code: FLR40, Free Shipping. 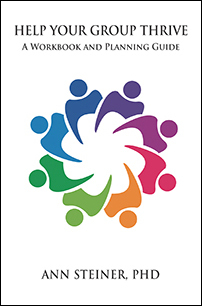 This revised workbook includes guidelines that can enrich and protect a wide range of groups. Whenever I teach "How to Start and Sustain Groups that Thrive", participants ask for my forms and worksheets. I created this workbook to provide a hands-on approach to the challenges of forming and maintaining cohesive, durable and effective groups. This easy-to-use manual includes a screening and preparation system, complete with modifiable forms. My screening and preparation system for establishing therapy groups is collaborative in nature. Over the years clients have found that the screening and life history formshelp them clarify what they want out of being in a therapy group. By using the forms and focusing on important areas when screening potential group members, clients and I decide whether they are likely to both benefit from and contribute to the group. Now that I use these forms and worksheeets, new group members feel more connected to the group process and the groups have significantly less turnover. "Dr. Steiner has put together a remarkably thorough and practical workbook for anyone considering starting a group…any group. Too often practitioners decide to start a therapy group, or are assigned the task of running a therapy group, without sufficient training. The workbook covers everything from therapist style, to the needs of different groups, to screening and group contracts, etc. There is no more difficult task in the world of therapy than beginning a therapy group. Dr. Steiner's workbook is a rich resource to be consulted periodically and prior to beginning your first group." Best Seller at the American Group Psychotherapy Association's annual conference, 2017 and 2018! Group therapists need to plan in advance for their unexpected absences. Dr. Steiner has created the downloadable Therapist's Professional Will,™ a document that spells out your wishes for the continuing care of your clients in your absence. In this audio CD, Dr. Steiner offers an upbeat, practical guide for people living with arthritis, diabetes, chronic illnesses or pain. She shares her story of discovering ways to coexist peacefully with arthritis and describes how she has been able to make her limitations just one part of who she is as a person. She helps listeners find new ways to make the most of life with limitations. Topics include: relationship issues, trust, and intimacy. The CD also benefits family members, health care workers, and those whose lives are affected by ill relatives and friends. This recording includes materials that have been road-tested over a long career of offering one-on-one counsel, lecturing, and giving presentations to professionals, patients, caregivers and family members nationally. Increase understanding of your reactions to the limitations illness brings. Meet your needs through suggestions and practical tips. Discover the gift of compassion for yourself. Group therapists who work with the medically ill are likely to be interested in this upcoming book. This easy-to-read, self-help work benefits providers, patients and all whose lives are affected by ill relatives or friends. This upbeat, practical guide for people living with chronic illnesses helps readers find new ways to make the most of life with limitations, deal with the challenges that illness brings to trust, intimacy, and other relationship issues. Dr. Steiner is a psychotherapist specializing in work with the medically ill. She has lived with arthritis since she was fourteen. As an author, professional speaker and former wheelchair user, she has a natural compassion and wisdom about the challenges of bringing joy, comfort and meaning to those with limitations. Many insightful discoveries from her personal challenges are distilled into the book and its worksheets. Until the book is available you may want to learn more about Dr. Steiner's work by ordering her CD: The Rollercoaster of Chronic Illness: How to Add Joy to the Ride. © Ann Steiner, Ph.D. All rights reserved. Reproduction without the author's written consent is prohibited.